Yes, according to a recent study by Lancaster and colleagues. Many marine mammals are precocial in that the young are relatively mature and mobile from the moment of birth. Juvenile dolphins for example are independently swim, surface to breathe, and maintain contact with mother on their own. But how developed is the hearing of a juvenile dolphin? Are their tiny, little ears fully formed? Alright so maybe they do not have ears per se just ear openings but you get the drift. Dolphin Skull. The auditory bullae is green. Dog Skull. Tympanic or auditory bullae in green. Inside a vertebrate skulls, including the dolphin, is an area referred to as the tympanic or auditory bullae. These hollow, spherical, bony structures are on the bottom, back portion of the skull and enclose parts of the middle and inner ear. 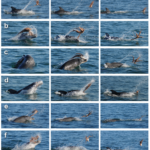 Lancaster and colleagues found in two species of dolphins, the Common Bottlenose and the La Plata, the tympanic bulla is same size in adults and juveniles, despite the smaller skulls and bodies of the young. Why would juveniles have adult-sized “ears”? Share the post "Do baby dolphins hear their parents?" Does this mean that baby dolphins can hear while still in utero?